We’d love your help. Let us know what’s wrong with this preview of Follies Past by Melanie Kerr. The story follows the events surrounding the wicked Mr. Wickham's seduction of the beautiful and innoce Follies Past is the result of a 5 year project to recreate the voice of Jane Austen herself by linguist and author Melanie Kerr. The story, characters, and setting are meticulously researched and written to give Jane Austen fans the closest thing to a new novel from her. To ask other readers questions about Follies Past, please sign up. Does anyone know why this is no longer available on Amazon UK? I've often wondered how many more variations can possibly be squeezed out of Pride and Prejudice. 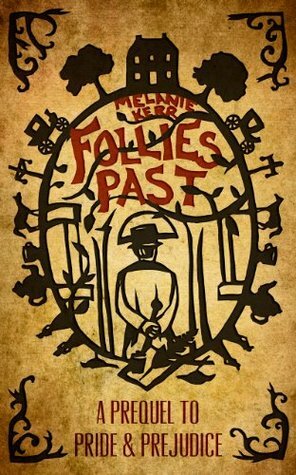 Follies Past: A prequel to Pride and Prejudice by Melanie Kerr takes up in great detail the events leading up to and surrounding the attempted elopement of Miss Georgiana Darcy and Mr. Wickham. At first, the story read like another uninspired re-telling of those events but the author deftly introduces several new characters into the mix and the plot picks up both momentum and complexity. This is the I've often wondered how many more variations can possibly be squeezed out of Pride and Prejudice. Follies Past: A prequel to Pride and Prejudice by Melanie Kerr takes up in great detail the events leading up to and surrounding the attempted elopement of Miss Georgiana Darcy and Mr. Wickham. At first, the story read like another uninspired re-telling of those events but the author deftly introduces several new characters into the mix and the plot picks up both momentum and complexity. This is the story of Lord Ashwell, the elder brother of Colonel Fitzwilliam and Miss Clare Langford, Georgiana's best school friend and daughter of an admiral. Initially, I assumed this was to be about Miss Caroline Bingley and her efforts to secure Mr. Darcy. The calculating and devious Mr. Wickham also tries to secure Miss Bingley so as to get at her fortune. Then it shifts to Georgiana Darcy and Mr. Wickham. Paralleling this harrowing encounter with Mrs. Younge encouraging Mr. Wickham, the unlikely romance between Clare and Lord Ashwell takes form. The author also includes cameo appearances by Lady Catherine DeBourgh, Anne DeBourgh, Louisa Hurst, and others in Jane Austen's original work. The complex intertwining relationships of the principals and how they inadvertently hinder or intentionally help each other carry the story along with doses of suspense, confusion on the part of many, and a beautiful romance over-arching the entire tale. Written in the style and language so reminiscent of Jane Austen, "Follies Past" is the perfect prequel to "Pride and Prejudice." Kerr gives depth to many of Austen's more minor characters in charming and often surprising ways. The novel also incorporates a unique and incredibly sweet love story of the author's own making that feels distinctly 'Austen-esque' in its tone and theme. I thoroughly enjoyed getting lost in this book. I usually tend to stay away from prequels or sequels to Austen novels Written in the style and language so reminiscent of Jane Austen, "Follies Past" is the perfect prequel to "Pride and Prejudice." Kerr gives depth to many of Austen's more minor characters in charming and often surprising ways. The novel also incorporates a unique and incredibly sweet love story of the author's own making that feels distinctly 'Austen-esque' in its tone and theme. When I was asked to review Melanie Kerr’s Follies Past on my blog www.rusticatinginthetropics.com, I agreed readily. The novel is termed a prequel to Pride & Prejudice, and who doesn’t love Pride & Prejudice? I was not to be disappointed. Melanie’s writing is stylistically on the money. She knows this time period well. She knows the familiar characters well too. None of the Bennetts make an appearance, but Darcy is present. So are Bingley and Wickham, and very true to how Austen created th When I was asked to review Melanie Kerr’s Follies Past on my blog www.rusticatinginthetropics.com, I agreed readily. The novel is termed a prequel to Pride & Prejudice, and who doesn’t love Pride & Prejudice? I was not to be disappointed. She knows the familiar characters well too. None of the Bennetts make an appearance, but Darcy is present. So are Bingley and Wickham, and very true to how Austen created them. We see the indomitable Lady Catherine de Bourgh and finally find out what is behind her daughter Anne’s silence. Two subplots give us more information about Caroline Bingley and Georgiana Darcy. The latter introduces a new and charming character who is Georgiana’s dear friend and who plays a big part in averting the scandal that almost overtakes her. Fans of Austen will delight in this book as much as I did, and even those not familiar with Pride & Prejudice will find a book that stands on its own mertis. This book is a prequel to Pride & Prejudice and I agreed to read it because of the fact that I so loved the original story. I wanted to love this story, but in all honesty, I hated it. HATED it. Of all of the books I've read this year, this one not only took me the longest to get through (but is actually one of the shortest I've read), it also made me so angry that I would put the book down, refusing to pick it back up. It almost became a DNF, that's how much I loathed this book, but I just This book is a prequel to Pride & Prejudice and I agreed to read it because of the fact that I so loved the original story. I wanted to love this story, but in all honesty, I hated it. HATED it. Of all of the books I've read this year, this one not only took me the longest to get through (but is actually one of the shortest I've read), it also made me so angry that I would put the book down, refusing to pick it back up. It almost became a DNF, that's how much I loathed this book, but I just can't DNF something, no matter how much I try. I found myself going back to the story, hoping I would change my mind about it, but I just could not. Now, before I explain why I hated it, let me say that this has NOTHING to do with the author. Ms. Kerr did an AMAZING job with the writing. She really caught the time, Austen's England and the way that the original piece was written very well. My hatred is purely for the story alone, and not even that, but four specific characters. From the first few pages, I disliked Caroline Bingley. Her attitude and her assumptions were just completely annoying. She wanted money, position and power and she was SO sure of herself that she couldn't see the truth before her. Then, when she does find someone who cares for her as well, she up and leaves him because he doesn't have the money and position he made out that he had. Sir Leicester seems like a GIANT creep. The way he is described is really good - made the whole idea of him just repulse me. Especially when he's sitting in the room talking (and drooling) over his cousin, drinking Mr Darcy's alcohol without anyone offering it to him, eating all of the cake like some fat oaf and being so disgustingly happy to tell of something that happened in the past, with no real proof (because it was never denied is not proof) all in the hopes of getting his cousin to want him so he could have her money. Disgusting. Now, if this is all stuff that you can get past, then I encourage you to read this story because, again, she did a great job. I just didn't like it. An Engaging Trip Back Into the World of Jane Austen! Follies Past takes place a year before Darcy met Elizabeth and the story revolves around Darcy’s sister, fourteen-year-old Georgiana and her school friend Clare, leading to Georgiana’s unfortunate interaction with the scheming Mr. Wickham. The book fits perfectly with Austen’s style and humor as do the characters, old and new. We even get a few brief closer looks into the characters of Caroline Bingley and Anne de Bourgh. And Lady Catherine de An Engaging Trip Back Into the World of Jane Austen! Follies Past takes place a year before Darcy met Elizabeth and the story revolves around Darcy’s sister, fourteen-year-old Georgiana and her school friend Clare, leading to Georgiana’s unfortunate interaction with the scheming Mr. Wickham. The book fits perfectly with Austen’s style and humor as do the characters, old and new. We even get a few brief closer looks into the characters of Caroline Bingley and Anne de Bourgh. And Lady Catherine de Bourgh never disappoints in her short appearances. The book is charming and good humored with a sweet love story involving Georgiana’s friend Clare as she tries to find a way to protect her friend from the devious Wickham. The book does so well using Austen’s writing style, it flows perfectly as a prelude into Pride and Prejudice. If you are one of the multitude of Jane Austen fans, this book is truly the best of the many attempts out there of continuing Jane Austen’s creative world. Anyone who loved Pride and Prejudice will love Follies Past. It captures the spirit of the original so beautifully, and provides a dramatic, convincing and sometimes shocking history to Austen's beloved characters while creating some brilliant new ones, woven into a very satisfying story. When Darcy wrote his post-proposal, world-altering letter telling Elizabeth the truth about charming Mr. Wickham’s duplicity I was as shocked and shaken as she was, but due to the discretion of the characters readers get just a bare outline of what went on between Wickham and Darcy’s sister Georgiana. What exactly did happen and how did it come about? One can’t help being curious--or at least this reader would like details--so when I discovered that Melanie Kerr’s Follies Past centers on that ev When Darcy wrote his post-proposal, world-altering letter telling Elizabeth the truth about charming Mr. Wickham’s duplicity I was as shocked and shaken as she was, but due to the discretion of the characters readers get just a bare outline of what went on between Wickham and Darcy’s sister Georgiana. What exactly did happen and how did it come about? One can’t help being curious--or at least this reader would like details--so when I discovered that Melanie Kerr’s Follies Past centers on that event I eagerly began the book, hoping it would be an Austen-worthy story with wit, appealing characters, and maybe even a wedding. Follies Past has three heroines and opens with none other than Caroline Bingley. She and her brother are on their way to Pemberley, and while this will be her first time meeting Darcy, Caroline is already determined to marry him, even contriving things so their arrival coincides with the flattering light of early evening. By the end of the visit Caroline is sure she is well on the way to an engagement, but back in London she becomes distracted when she falls hard for another man. He has no title or estate, but he’s disarmingly handsome, they share a wicked wit, and he’s absorbed with her in a way she realizes Darcy never was. The power of their attraction gives her second thoughts about marrying a man she “loves” mainly for his wealth. True to her P&P characterization, Georgiana is painfully shy and the idea of mingling with London society overwhelms her, so Darcy allows Georgiana’s dearest, slightly older school chum to accompany her on a visit to the city. Clare, the story’s third heroine, is principled, sweet, genteelly determined, and sometimes conflicted. She loves reading novels but believing they are bad for the soul she throws all hers away before the trip, planning to set a good example for Georgiana. Georgiana looks up to Clare and they adore each other, but their situations are very different. While Clare has a highborn grandfather, she is also the daughter of a military man and without much fortune. Unlike Georgiana she has limited marriage prospects and as the book goes on her story becomes prominent. When the trip to London reunites Georgiana and Wickham, who Georgiana adored as a child, it is Clare who is alarmed by Georgiana’s growing and, Clare thinks, inappropriate attachment. Darcy would set things right but he’s out of town inspecting properties with Bingley. Georgiana becomes distant and secretive so Clare decides she must do something, but what? There is no one around she can trust to help or advise her. Going to London is a wonderful opportunity for Clare, but being strictly brought up she feels distinctly uncomfortable around much of that city’s society, especially Darcy’s black sheep London cousin, the now ailing Lord Ashwell. Darcy has assured Georgiana that the vile rumors circulating about their cousin are just gossip, but might Darcy be blinded by family loyalty? Desperation to protect Georgiana forces prudent Clare to put herself in company she would avoid under any other circumstance. I found so much to enjoy in Follies Past, including the sympathetic portrayal of Caroline Bingley. She’s the same character we met in P&P, but with more insight into her heart I felt moved by her story. Passages describing Caroline falling in love are the most convincing in the book, without being lewd they practically sizzle. Playing small but important roles in the story is Lady Catherine de Bourgh’s taciturn daughter Anne, and what a treat to get to know her--she’s a closet naturalist! Get Anne going about insects and she has lots to say. Anne also retains her P&P persona, but now that author Kerr has her talking we learn she has plans for her life, and isn’t the pawn of her mother everyone, including Lady Catherine, thinks she is. Even Wickham gets a touch of tenderness from Kerr. We see him thwarted in love (yes, Wickham in love!) and with his hopes to lead a settled life dashed when Darcy (justifiably) denies him the living. It’s possible to (briefly) feel a little sorry for him. I felt the foiling of Wickham’s elopement plan happened abruptly, once everyone was in place it resolved in a few paragraphs and Georgiana let it go very easily, but by then Clare has become the heart of the story. The steps Clare took to help rescue Georgiana, and how those actions affect her future bring about a very Austen-worthy happy ending. Follies Past delighted me so much I actually cheered out loud a few times while reading. Miss Kerr manages to evoke the essence of Jane Austen in the first sentence of this book, and carries it through to a satisfying ending with humour, intelligence and heart-warming characterisation. It begins with Caroline Bingley’s conviction that Fitwilliam Darcy is romantically interested in her, and is then proved completely wrong, though it takes Caroline a while to accept it. The reader is given the opportunity to take a shadenfreude type pleasure in Caroline’s self-delusion – attributable Miss Kerr manages to evoke the essence of Jane Austen in the first sentence of this book, and carries it through to a satisfying ending with humour, intelligence and heart-warming characterisation. It begins with Caroline Bingley’s conviction that Fitwilliam Darcy is romantically interested in her, and is then proved completely wrong, though it takes Caroline a while to accept it. The reader is given the opportunity to take a shadenfreude type pleasure in Caroline’s self-delusion – attributable entirely to Miss Austen’s original ability to make us hate her when she doesn’t do anything that terrible. This is more the story of Wickham and the alleged elopement with Georgiana, not to mention the duplicitous Mrs Young. The language is exquisite, and so Austen-like I found it hard to differentiate between them. The story is well researched, giving new life to not only Georgiana, but Darcy as a man and not a suitor for Elizabeth Bennet whom he hasn’t met yet. The characters are well rounded and fascinating in their own right, and I don’t think Ms Austin would have objected to how the author has given new life to her secondary characters. The casually insulting and insufferable Lady Catherine de Bourgh is a masterpiece, I really enjoyed this novel, and I hope there are more in the same vein. Like another reviewer has said, my only criticism is the clumsy artwork on the cover, this book deserves something far more artistic and beautiful. Definitely one of the best fan fiction books I have read. From the first two paragraphs it was clear to me that I was to become a captive audience. The language was beautiful and very similar to Austens. It was a fast read and what a delightful fast read. Darcy, Lord Ashwell, as well as Caroline Bingley with her exuberant ego and hilarious schemes make appearances in this novel. I fell in love with the character of Clare, for she was a reader. I loved the way the author included titles of books that were popular during that time. The research was remarka From the first two paragraphs it was clear to me that I was to become a captive audience. I fell in love with the character of Clare, for she was a reader. I loved the way the author included titles of books that were popular during that time. The research was remarkably on target. The romance between Clare and Lord Ashwell gave the book the period romance it needed and all the characters were well-developed. As to Wickham and Mrs. Younge I say "shame on you." As I neared the end, I was sad to be leaving the cast of Folly, but then I remembered. I could read Pride and Prejudice again. This book is a prequel to what could have happened prior to the Story of Pride and Prejudice. The story focuses on young Georgianna, she is leaving Pemberley and heading off to continue school in London. We have some original characters Mr. Wickhan and Mr. Darcy to name a few. “Follies Past” should be the name of the file folder for every other Jane Austen spin off, because this book blows them all out of the water. This is by far the best Austen spin off I’ve had the pleasure of reading. Most Pride & Prejudice sequels or prequels read like fan fiction, but Kerr has managed to construct a novel that reads like one of Austen’s own making. It could very well have been a long lost manuscript of Jane’s, documenting the characters of Pride & Prejudice before they en “Follies Past” should be the name of the file folder for every other Jane Austen spin off, because this book blows them all out of the water. This is by far the best Austen spin off I’ve had the pleasure of reading. Most Pride & Prejudice sequels or prequels read like fan fiction, but Kerr has managed to construct a novel that reads like one of Austen’s own making. It could very well have been a long lost manuscript of Jane’s, documenting the characters of Pride & Prejudice before they encounter the Bennets. Prejudice and I enjoyed reading it for St. The story of Wickham, told with such broad strokes in Austen's Pride and Prejudice, is fully explored here by Kerr. The period, the prose, the characters, all feel very Austen-esque. A delightful read for Austen fans and literature fans alike. I loved every page of this novel. It is exceptionally well written. It was for me a book hard to put down - one that you didn't want to end. If you loved Pride and Prejudice you will love this one. One of the better Austen prequel / sequels, the author really knows her P & P characters. In this charming and praiseworthy debut novel, author Melanie Kerr pens a prequel to Pride and Prejudice that surprisingly is not centered on Mr. Darcy or Elizabeth Bennet! Instead she chooses to flesh-out and fill in the histories of Caroline Bingley, George Wickham, and Georgiana Darcy. (Not one Bennet will you find here!) And while we do see our reserved and illustrious Mr. Darcy on the page quite a bit, this prequel focuses on other characters, especially three women: Caroline Bingley, Georg In this charming and praiseworthy debut novel, author Melanie Kerr pens a prequel to Pride and Prejudice that surprisingly is not centered on Mr. Darcy or Elizabeth Bennet! Instead she chooses to flesh-out and fill in the histories of Caroline Bingley, George Wickham, and Georgiana Darcy. (Not one Bennet will you find here!) And while we do see our reserved and illustrious Mr. Darcy on the page quite a bit, this prequel focuses on other characters, especially three women: Caroline Bingley, Georgiana Darcy, and Clare Langford, Georgiana’s dearest friend from school. Since I felt three distinct story-lines with three different heroines in this novel, I thought I’d break down my review in a similar fashion. Georgiana Darcy: Here we see Georgiana become reacquainted and enamored with George Wickham. We see how the perfidious Mrs. Younge is the prime instigator and promoter of this match and how Georgiana, with her eagerness to grow up, experience love, and be Wickham’s savior, was so easily worked on. (Boy, Mrs. Younge is a nasty piece of work!) I enjoyed how Ms. Kerr portrayed Wickham, I liked that he was a reluctant participant to this scheme. Clare is definitely the true heroine of this piece, she wins us over with her substance, moral center, and true friendship. She felt reminiscent of Georgette Heyer heroines to me – artless, perceptive, and not easily thwarted; and I completely admired and adored her! In addition, I loved Lord Ashwell, the black sheep in the Fitzwilliam family. I was dying to learn what he did in his past and why there were so many rumors circulating about him! And I thought it was brilliant how the author kept in suspense so long! The scenes with Lord Ashwell were splendid, what an intriguing character, I was deeply invested and moved by hime and his story-line. I loved how well this thoughtful and illuminating prequel tied into Pride and Prejudice, the new character additions and fleshed-out histories were both creative and believable. I greatly enjoyed learning things like: why Colonel Fitzwilliam is appointed to be Georgiana’s guardian instead of his older brother and how Darcy came arrive in Ramsgate earlier than expected. The answers were equally satisfying and fitting. I also loved seeing some life put into to Anne de Bourgh and hearing about her not-so-dull existence. I have a general rule for books that are companions or inspired by earlier, classic works. The general rule is this: Don't read them. Too many times have I've been disappointed by a play-off of Peter Pan, Les Miserables, and, yes, Pride and Prejudice. It's better to leave the works in the hands of their old, dead masters, right? Not always. Take this book for instance. When I was asked if I should like to review Follies Past, I was a little hesitant, but also very intrigued. A prequel to Pride I have a general rule for books that are companions or inspired by earlier, classic works. The general rule is this: Don't read them. Too many times have I've been disappointed by a play-off of Peter Pan, Les Miserables, and, yes, Pride and Prejudice. It's better to leave the works in the hands of their old, dead masters, right? Not always. Take this book for instance. When I was asked if I should like to review Follies Past, I was a little hesitant, but also very intrigued. A prequel to Pride and Prejudice exploring the Darcy-Wickham disaster? Of course I'd be curious! So, with equal amounts trepidation and excitement, I said that it would be my pleasure to read and review Follies Past. Melanie Kerr has a fantastic grasp on the regency era. She's obviously done her research and the mannerisms, descriptions, and speech patterns were down to a "T." Her very style of writing mimics Austen's and it's easy to imagine that this was truly a story written by the renowned lady herself. Not only does the book sound like Austen's, but the characters aren't too unbelievable so as to ruin the illusion. Georgiana Darcy is delightful, timid, and naive- just like she should be. Her brother was less of a focus, but what we saw of him seemed very fitting. The same for Bingley and Wickham. They were all familiar and I thought, yeah, they'd do that. Catherine de Bourg renews her appearance and is as pompous as ever. Anne was... something. Not exactly like in the original, but I appreciated her! The only character that I felt a bit unconvinced with was Caroline Bingley. She was very like herself, but she did a few things that I just did not believe she would ever, ever do. I enjoyed her story arc, but it didn't exactly click. We are introduced to new characters as well- Lord Ashwell, Sophia, and Clare. I found them all good characters in their own ways, and certainly a welcome addition to the tale. As for the plot... well, we all kind of know it already, but believe me, there are twists and aspects that Melanie Kerr added that are unique and work marvelously! The plot certainly kept me engrossed for two days straight until I finished the novel. Generally I reserve five stars for books that I believe have held up over time, or will stand the test of time, for example JK Rowling's series, Harry Potter, or Harper Lee's, To Kill a Mockingbird. I believe that Melanie Kerr has done an exemplary job at keeping pace with Jane Austen in her book, Follies Past: a Prequel to Pride and Prejudice. The Austeneque novel opens with Caroline Bingley packing her belongings, and plotting her path to becoming the Mistress of Pemberley. It is her first visi Generally I reserve five stars for books that I believe have held up over time, or will stand the test of time, for example JK Rowling's series, Harry Potter, or Harper Lee's, To Kill a Mockingbird. I believe that Melanie Kerr has done an exemplary job at keeping pace with Jane Austen in her book, Follies Past: a Prequel to Pride and Prejudice. The Austeneque novel opens with Caroline Bingley packing her belongings, and plotting her path to becoming the Mistress of Pemberley. It is her first visit there, though her brother is already very good friends with Mr. Darcy, Master of Pemberley. Caroline's sister, Louisa, must stay in town to prepare for her wedding to Mr. Hurst, so the two women busily hatch schemes to win the affections or monies of Mr. Darcy. From there we are introduced to all the beloved characters of Pride and Prejudice, and a few additions. Ms. Kerr weaves thoroughly enjoyable backstories, beginning several months before Jane Austen's novel commences, with Miss Elizabeth Bennet and Mr. Darcy's meeting in Hertfordshire. The author creates compelling subplots, letting Jane Austen's speech cadence and vocabulary drive the dialog, but Ms. Kerr adds her own unique twists and turns to the saga. By the time we rejoin the original story, with the news that Netherfield has been leased, our beloved cast and crew have already had many adventures; love has been found, hearts have been broken, battles have been fought. I strongly encourage any Austenite to read this novel. It is a must read. The time and style of Jane Austen adeptly captured in this prequel by Melanie Kerr. What an enjoyable read. Focusing on the time a year before the beginning of Austen's classic work, Follies Past delves into Wickham's betrayal of Mr. Darcy's younger sister Georgiana and focuses on some of the lesser known characters of P & P; introducing some interesting new ones along the way. Aside from Georgiana's interesting story, the reader learns a bit more about the self-centred Caroline Bingley and h The time and style of Jane Austen adeptly captured in this prequel by Melanie Kerr. In Follies Past: A Prequel to Pride and Prejudice, first-time novelist Melanie Kerr breathes new life into Jane Austen's world. Well-written and extensively researched, Kerr captures the essence and style of nineteenth century England. The tale focuses on some of Austen's supporting cast -- Georgiana Darcy, Caroline Bingley and Anne de Bourgh -- and places Mr. Darcy and Mr. Bingley in a smaller, secondary role. Kerr works hard to match details and plotlines from Pride and Prejudice, but also makes Follies Past her own. There are several new characters to cheer for, particularly two with a romantic storyline I really enjoyed. While there are many prequels and sequels relating to Jane Austen's classics, Follies Past is one I heartily recommend reading! We are proud to announce that FOLLIES PAST: A PREQUEL TO PRIDE AND PREJUDICE by Melanie Kerr is a B.R.A.G.Medallion Honoree. This tells a reader that this book is well worth their time and money! I received a paperback copy from the author in exchange for an honest review. Since the very moment when I started reading this book, I must confess that I was very surprised. I have read other books based on Jane Austen's novels, so I was expecting to find one more book pretending to be as great as the original, but failing completely. However, what I found here was a book that imitates quite well, almost perfectly well, Jane Austen's style, or at least, the Regency writing style. And for that, I received a paperback copy from the author in exchange for an honest review. Since the very moment when I started reading this book, I must confess that I was very surprised. I have read other books based on Jane Austen's novels, so I was expecting to find one more book pretending to be as great as the original, but failing completely. However, what I found here was a book that imitates quite well, almost perfectly well, Jane Austen's style, or at least, the Regency writing style. And for that, I am grateful. After having read another book based on the Regency period that used the word "whatchamacallit", I had almost lost faith in reading something that could recreate the atmosphere of Austen's books. This book does, so kudos to Melanie Kerr. It really shows that the author has made a lot of research on the period. This is a prequel to Pride and Prejudice, and it is focused on how Mr. Wickham tried to take revenge on Mr. Darcy by eloping with his sister Georgiana. And since the story was about that, I really don't understand all those many many chapters dealing with Caroline Bingley, most annoying character ever. It felt like reading two books. The book starts with a focus on Caroline Bingley and his infatuations, and when you are almost halfway reading the book, there is a change and now the focus is entirely on Georgiana. That was odd and not very consistent. I have to admit I had never read Pride & Prejudice - and never really had an attraction to historical romance novels...BUT!!! Follies Past was fantastic. It took me a little bit to get into only because Ms Karr stayed true to Jane Austen's style and wrote in the language of the time. Once I got the swing of it the story was so wonderfully written that I had to keep reading! Because I had no previous knowledge of the story the characters and the story line were just that a story...and by the en I have to admit I had never read Pride & Prejudice - and never really had an attraction to historical romance novels...BUT!!! Because I had no previous knowledge of the story the characters and the story line were just that a story...and by the end of it I knew I had to read Pride and Prejudice to see what happened next to the wonderful characters. So after reading P&P, Follies Past had given me quite an insight into the characters - especially Mr Wickham. Over all though Ms Karr has written in beautiful tribute a prequel to the very famous novel. Ms Karr clearly shows her linguistic skills as well as her very talented writing ability. If you are a lover of historical romance then you will love this book...if you are a lover of all things Austen or Darcy then you will most definitely love this book. Follies Past starts about a year before the beginning of Pride and Prejudice, with the Bingleys spending Christmas at Pemberley. It follows Georgiana Darcy and her schooldfriend Clare Langford as they arrive in London, meeting among others Caroline Bingley. We are also introduced to Lord Ashwell, Colonel Fitzwilliam's elder brother, Mrs. Younge, and Wickham; as they converge on Ramsgate. Melanie Kerr studied linguistics, English and theatre at the University of British Columbia and law at the University of Alberta. Melanie is a reckless lover of clotted cream, a staunch defender of the semi-colon and a fierce opponent of unpleasant music. She wooed her current and only husband with false promises of skill at word games and eternally good hair. She lives in Edmonton, where she rais Melanie Kerr studied linguistics, English and theatre at the University of British Columbia and law at the University of Alberta. Melanie is a reckless lover of clotted cream, a staunch defender of the semi-colon and a fierce opponent of unpleasant music. She wooed her current and only husband with false promises of skill at word games and eternally good hair. She lives in Edmonton, where she raises her two sons, sews her own Regency costumes, runs a Jane Austen Fun Club, blogs on all things old and English, endeavours to take over the world and occasionally practices law. Follies Past is her first novel.